Hah! Just kidding. Sort of. That’s what it used to be called. Of course, it’s just my opinion but there’s a few people in this place who really aren’t playing with a full deck. Problem is, they all work here and get paid for doing so! I’m Fern. You’ll meet me in A Clue in the Stew. You won’t find me in any of the other Soup Lover’s Mysteries, just this one, but that’s okay because I have a really pivotal role in that book. Right now, I’m a little distracted because I’m very worried about Dr. Cranleigh. She’s my boss – Dr. Cynthia Cranleigh. She’s a psychiatrist and one of the nicest, most compassionate people I’ve ever met. If it weren’t for Dr. Cynthia, I would have quit or retired a long time ago. The reason I worry about her and try to keep tabs on her is that she gets too involved with her patients. She carries their worries around. I can see it on her face. Right now, she has a patient that I know she’s concerned about. The poor woman doesn’t have a lot of resources and I think she’s had a hard life. Dr. Cynthia spends a lot of time with her and I suspect, doesn’t charge her much at all. Maybe nothing. That’s the kind of person Dr. Cranleigh is. This mysterious woman comes to see her in the evenings once a week. I’m not here when she comes so I don’t get to pick up much information. But the next day when I file Dr. Cranleigh’s notes away, I make sure I read them very thoroughly. And now Dr. Cranleigh has taken a few days off. She wouldn’t tell me where she was going. And I can’t help but think it has something to do with this particular patient. I haven’t heard from her and I’m getting more and more worried. I wish she’d call and let me know she’s all right. I sit by the phone every day hoping to hear from her and praying that she’s not in any trouble. What do you think? Should I be worried about her? 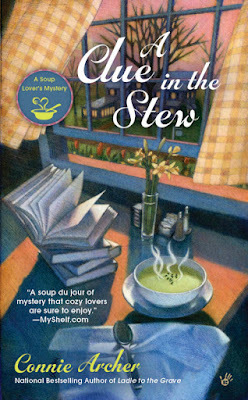 If you like to learn more about the mysteries and adventures in A Clue in the Stew, you can visit my author, Connie Archer, at her website on Facebook or Twitter @SnowflakeVT. had not heard of this series!!! Gonna look for this next time I'm at a bookstore! Thank you for the review! Hi Anne - I think you'd enjoy the mysteries and adventures in Snowflake, Vermont! The series starts with A Spoonful of Murder. Happy reading! I think that most women worry about everything. Well, I do, some things more and some things less, but I do worry. So go ahead and worry about Dr. Cranleigh as she is an important "person" to you for sure. I loved the first two books in this series, but do need to catch up and definitely want to get your latest. I love New England, being a native myself, so all books about the North East are my kind of fun reading. Loved the blog post today too. Hi Cynthia - So great to see you here! I grew up there too and this is my way of keeping in touch, especially this time of year. Autumn is my favorite season I think. A Clue in the Stew where Fran appears is Book #5. Hope you can catch up with everyone's adventures at the soup shop! Hi Kate -Just saw your comment. I'm not sure which of us was running this contest, but I will pass on your information to our moderator. Good luck! I have read the first four books in this series. I can hardly wait to get this newest in the series. Sounds very exciting. Hi Dianne - My apologies. For some reason, your comment didn't show right away. Thanks so much for writing, and I'm so glad you've enjoyed the stories in Snowflake. I hope you're able to read A Clue in the Stew soon! I think we'll be doing a holiday giveaway next month, so please stay tuned!